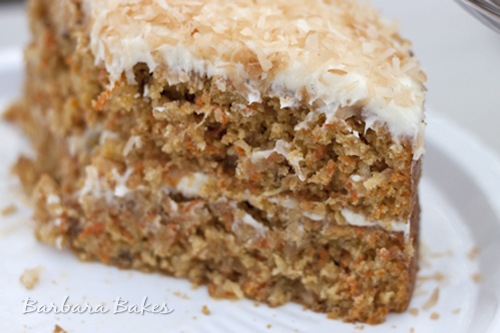 If you’re looking for a fabulous carrot cake recipe, look no more. This is the best carrot cake I’ve ever tasted. It’s sweet but not too sweet; moist but not too dense or heavy. The frosting was a perfect match for the cake – light and creamy. I’ve been looking for an excuse to make carrot cake since Bethie, You Know What You Oughta Do, posted Cook’s Illustrated’s Simple Carrot cake with Cream Cheese Frosting. A recent family get together/birthday party was the perfect excuse. 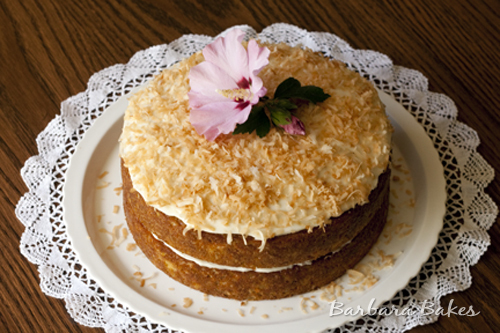 I decided I wanted to bake with Earth Balance Coconut Spread again, which lead me to adapt Cook’s recipe in to a Tropical Carrot Cake loaded with shredded coconut, crushed pineapple and macadamia nuts, topped with a Coconut Cream Cheese Frosting. I also reduced the spices so the tropical flavors would shine through. The method for mixing the cake is a little unusual. You use the food processor to emulsify the oil with the sugar and the eggs before incorporating the rest of the ingredients. 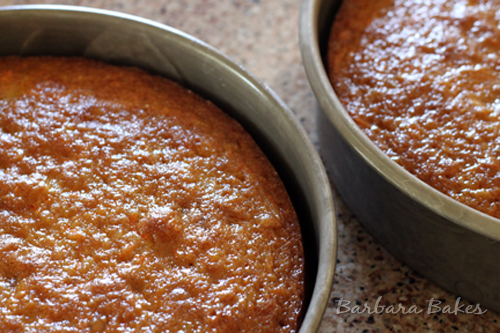 I couldn’t resist taking pictures of the cakes after they came out of the oven. They baked up beautifully. I loved the gorgeous color. I wish I’d gotten a better picture of the cut cake, but I was lucky to get a picture before it was gone. 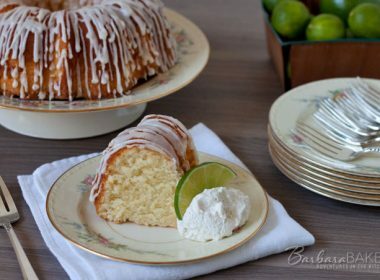 You can make this cake in a 13 x 9-inch pan and I think it would make a great bundt cake too. Just make the frosting a little thinner so you can drizzle it over the bundt and then sprinkle with toasted coconut. Now that I think about it, I hope I have a good excuse to bake a bundt cake soon. Preheat oven to 350º. Spray 13 x 9-inch baking pan or 2 9-inch round cake pans with nonstick cooking spray. Whisk together flour, baking powder, baking soda, cinnamon, pumpkin pie spice, and salt in medium bowl; set aside. Shred carrots in food processor fitted with large shredding disk; transfer carrots to bowl and set aside. Wipe out food processor bowl and fit with metal blade. Process granulated and brown sugars and eggs until frothy and thoroughly combined, about 20 seconds. With machine running, add oil through feed tube in steady stream. Process until mixture is light in color and well emulsified, about 20 seconds longer. Pour mixture into large bowl. Stir in carrots, coconut, nuts, and pineapple. 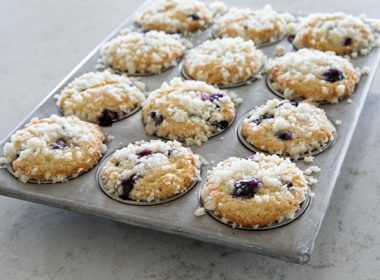 Mix in dry ingredients until incorporated and no streaks of flour remain. 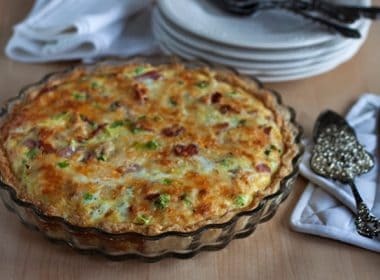 Pour into prepared pan and bake until toothpick or skewer inserted into center of cake comes out clean, 35 to 40 minutes, rotating pans halfway through baking time. Cool cake to room temperature in pan on wire rack, about 2 hours. For 9-inch rounds Cool 10 minutes; remove from pans to wire racks. *I reduced the amount of baking powder and sugar for high altitude baking. 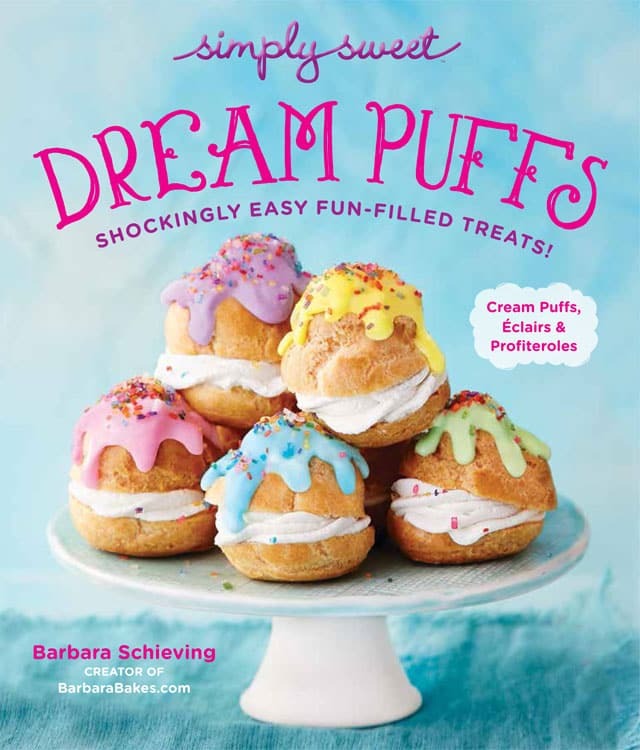 Original recipe calls for 1 1/4 teaspoons baking powder and 1 1/2 cups sugar. Note: Substitute 1/2 teaspoon ground cinnamon plus 1/4 teaspoon ground ginger, 1/4 teaspoon ground nutmeg and 1/8 teaspoon ground cloves for 1 teaspoon pumpkin pie spice. When cake is cool, beat together cream cheese, coconut spread, sour cream, and vanilla until combined, scraping down bowl as needed. Beat in confectioners’ sugar until smooth. 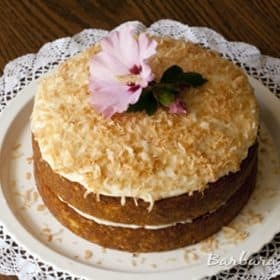 Frost cake and sprinkle toasted coconut on top. Store in the fridge. I just wanted to let you know that I made the cake for the annual tennis tournament (two 9 by 13 layers stacked). It was an enormous hit. I used fresh pineapple puree (6 ounce strained plus 1/4 cup juice) per cake and ground toasted pecans in lieu of macadamia nuts (since the bulk raw macadamia nuts are not big sellers and tend to be stale ). I also used a blender to create the emulsion (I do not have a big food processor). I have a pic to send you, but I can’t seem to figure out how to post it here in the comments. Oh, well, it was lovely with a tennis net, cake topper tennis players (Big Bird versus Kool Aid Man), and nuts all around the sides. Thanks again. Your blog is wonderful. Your responses to my questions were helpful. Still loving the USA Pan. Thanks for the update! The cake sounds spectacular. 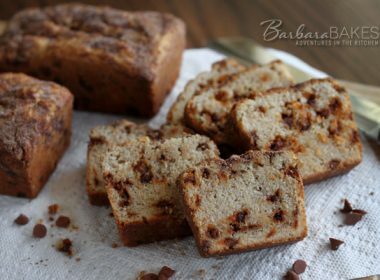 You can’t share photos in the comments sections, but you can share it on Facebook https://www.facebook.com/BarbaraBakes. I’d love to see it. I plan to make this cake for a large gathering. My plan is to make two 13 by 9 inch cakes and stack them. Do you foresee any problems with cracking as I transfer one cake on top of the other? Some cakes are very fragile and do not tolerate transfer very well. One other question I have is whether you used salted and roasted macadamia nuts or raw nuts. And still one more question is whether the coconut is a pronounced texture in the cake. My husband does not care for the texture of coconut, for example, in a Mounds Bar. My prediction is that the coconut will be no more of a texture element than the carrots, but I’d love to hear your views. Thanks for your blog. It’s wonderful. PS: I did buy the USA sheet pan that you recommended in the comments section of a different post. Thanks for that recommendation. Wonderful pan with straight sides. Hi Chris – so glad you’re enjoying the pan and my blog! Yes, I think this cake is sturdy enough to stack two 13 x 9 inch cakes. Yes, the macadamia nuts are raw nuts. No the coconut in the cake is not pronounced. You could even roughly chop your coconut so it hides in the cake even more. I hope your crowd enjoys the cake as much as we did. You have won me over to try that Earth Balance spread – I’m adding it to my grocery list today and just praying I can find it here in central Oklahoma. I love the twists on this carrot cake. You know how to pick ‘em Barbara! Can i subsitute the same amount of butter for the Earth Balance? looks yummy and something different. 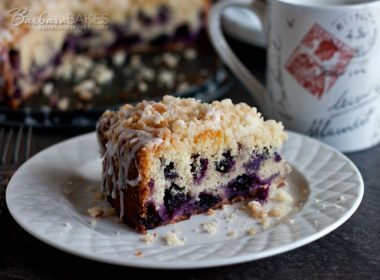 I love all these cake recipes you’re posting! Hi Sheri – I would recommend substituting canola or vegetable oil in the cake and butter in the frosting. You could try melted butter in the cake, but since butter has less fat and I haven’t tried it with butter, I can’t recommend it. Let me know if you try it. Thanks! wow if it tastes as good as it looks then its going to be fantastic. I have friends coming over this weekend so i’m gonna make it for them. i’ll let you know how they like this carrot cake recipe compared to theirs. Thanks Mary Jane! Hope you like it as much as we did. That looks so good. OMG i am loving this. The funeral potatoes look awesome, but I have a sweet tooth today. I use Earth Balance on a daily basis, toast, and anything ‘I eat’ that calls for butter. Of course, I use real butter in all my baking and cooking for the blog and others, so I love that you used EB in this cake. If I had in mine, maybe I would have had more than one piece. 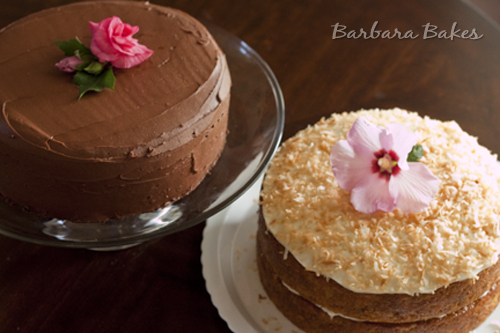 It looks gorgeous, Barb – love how you stacked and topped it. I’m always game to try a new carrot cake recipe. The coconut added is a good call. You know how to pick ’em Barbara! I want to make this for my son’s birthday. Can i subsitute the same amount of butter for the Earth Balance? 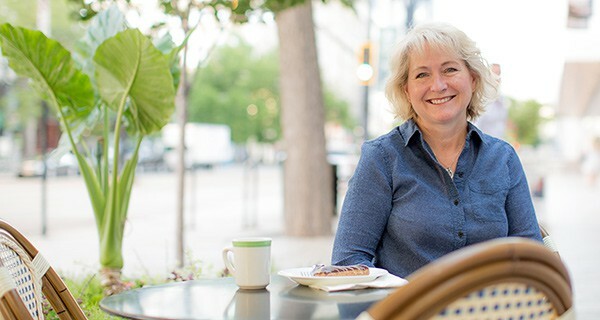 Hi Frances – I would recommend substituting canola or vegetable oil in the cake and butter in the frosting. Hope he enjoys it! And I’ve had carrot cake on my mind lately! I’d take a slice of both too, I wouldn’t want to miss out.